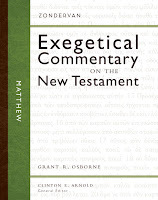 Two days ago, I posted some initial thoughts on Grant Osborne’s new commentary on Matthew in Zondervan’s Exegetical Commentary on the New Testament series. Today I thought I would make some observations about Osborne’s section on Matthew 1:1–17. I will make my cursory comments on the sections as they occur in the commentary. This is an important feature lacking in some commentaries, namely, explaining how the section at hand fits with what has gone before and what follows. In the case of Matthew 1:1–17, nothing has preceded the section, but Osborne points out that the section sets the tome for the Gospel: “Matthew begins with genealogical proof that Jesus is indeed the Davidic Messiah and that God has sovereignly controlled his ancestry. This proves that Jesus is the son of Abraham and of David and sets the tome for the rest of the book” (p. 57). Again, this is an important feature. One key to doing exposition is asking and answering the question, “What is the main or central idea of the passage at hand.” Osborne suggests that the main idea is that, “Matthew shows that Jesus is the expected Davidic Messiah, whose pedigree demonstrates his claim. At the same time he shows that the lineage of Jesus goes beyond Jewish heritage to embrace the Gentiles as well, thereby preparing for his theme of universal mission” (p. 57). The only observation that I would make is that Osborne try to synthesize the main idea into one sentence. I like the fact that Osborne has provided his own translation. It is helpful to see how different scholars translate the text in comparison to major English translations. I also appreciate that in this series the author’s translation is formatted in graphical (or structural) layout form. Osborne provides a good discussion of the “fourteen” structure of the genealogy. I do wonder why Osborne does not discuss the genealogical literary form. He does discuss the differences in genealogical forms in his explanation of the text, but this section seems like the more logical place to put that discussion. Osborne provides a fairly thorough discussion of the text. Some might be surprised by how much can be said about a genealogy. On a formatting note, not all readers will appreciate the editorial decision to include the English translation and Greek text at the beginning of the individual comments. But, I find this feature helpful, although it surely adds to the length of the book. I applaud the inclusion of this section. It has always seemed strange to me that some commentaries ignore the theology of the theological texts that they are commenting on. However, I wonder whether if this section is a bit misnamed. A better designation might be “Theological Contribution” or “Theological Principles,” since there is very little actual application. Readers will probably be disappointed if they look to this section for insights into how to apply the text to their lives.